An intranet site installed by the Polish authorities provides participants with continuous information in real time about the delivery of the addresses and the progress of the briefings. In the Warsaw royal palace, literally dozens of television screens retransmit the proceedings and speeches of the Heads of State and Government. Personal screens are made available to each delegation in the meeting room. 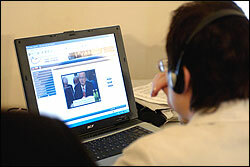 An Internet site in 6 languages specially created for the Summit allows two Council of Europe teams in Strasbourg and Warsaw to transmit Summit speeches, statements and photos rapidly. Thus the Warsaw Summit will remain the first high-level international political meeting to have been made accessible live in its entirety. Some ten hours of potentially accessible images and sound help bring the event to the public in a transparent form.